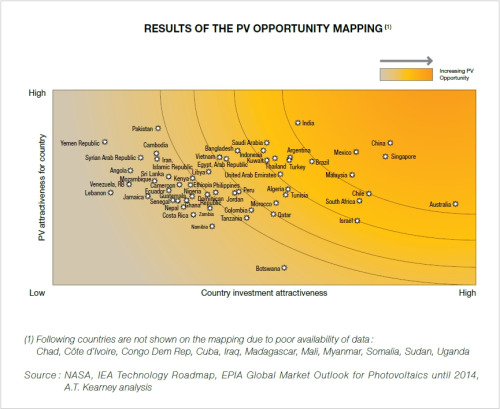 Solar PV opportunity mapping of Sunbelt countries. © EPIA. Solar PV potential scenarios for the Sunbelt. © EPIA. Focus regions of Sunbelt as scope for regional analysis. © EPIA. 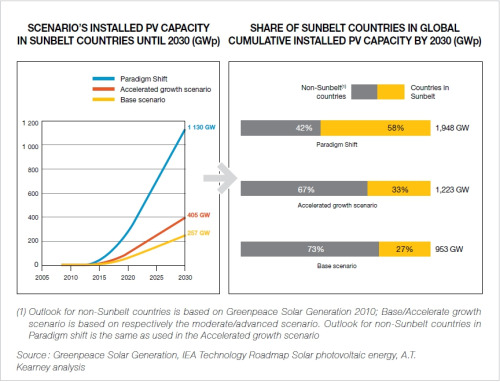 Under an Accelerated scenario, the 66 Sunbelt countries based within 35° of the Equator, could reach an installed solar PV capacity of 405 GW by 2030, bringing electricity to around 300 million people and make up 2.5-6% of the Sunbelt’s overall power generation, EPIA says. By 2020, solar PV can reach levelised cost of energy (LCOE) of €0.05-0.12/kWh in Sunbelt countries, making it more competitive than gas or oil fuelled peak power plants. By 2030, the cost could drop to €0.04-0.08/kWh making solar PV competitive with “all forms of coal and gas-fired mid-load plants, even if assuming only modest fuel price increases,” EPIA says in its latest report, Unlocking the Sunbelt potential of photovoltaics. “Based on further technology development it is safe to conclude that modules and inverters will follow the respective well-known Price Experience Curve which will result in a PV generation cost of €0.06-0.12/kWh by 2020 and as low as €0.04-0.08/kWh by 2030,” Winfried Hoffmann, Vice-President of EPIA says. “Already in 2020, PV will be competitive to the generation cost of clean coal power stations while in 2030 all conventional power generation technologies will be more expensive compared to PV”, he adds. EPIA’s report looked at 66 of the Sunbelt countries with a total of 5 billion inhabitants representing around 95% of the Sunbelt, and 75% of the world population. The countries had a combined GDP of US$15.7 trillion and consumed roughly 6.8 PWh of electricity – 97% of all electricity demand across all Sunbelt countries. EPIA says a set of preconditions must be met, however, for the Sunbelt countries to reach their potential. First of all, governments and utilities must consciously include solar PV as an explicit part of their energy vision and investment planning. The solar PV industry also needs to increase its commitment to contribute to domestic economic value generation through investment in solar PV manufacturing capacity and establishment of local service offerings. Development banks and private financial intermediaries need to actively address the finance gap that exists in many Sunbelt countries. Transferring experience from established solar PV markets and collaborating closely with governments and PV industry is key to facilitate project financing, EPIA says. Of the top 10 solar PV market at the moment, 9 are located outside the world’s Sunbelt despite the much higher solar irradiation of Sunbelt countries, which make up only 9% of installed capacity today. At the same time, expected electricity demand growth in the Sunbelt is much higher than in non-sunbelt countries. According to the IEA World Energy Outlook, almost 80% of the expected global electricity demand growth will come from Sunbelt countries. Sunbelt countries are facing a set of energy challenges in the future – the greatest of which is probably that electricity consumption is forecast to grow by about 150% within the next 20 years. Furthermore, infrastructure is often poor, and 1.5 billion people have no access to electricity. Many Sunbelt countries have a high dependency on imported fuels, and large investments are needed in generation and system infrastructure. At the same time, pressure is being put on these countries to increase power generation without increasing CO2 emissions and environmental impacts. According to EPIA, solar PV could help solve some of these issues. Solar PV can be used outside the grid or within mini-grids. It can also be used alongside other power generating technologies in hybrid systems. High irradiation levels in Sunbelt countries already make solar PV competitive compared to diesel generators. Solar PV is also a low-carbon technology, and according to EPIA, it has an energy payback time of 10-20 months. However, to benefit from solar PV, barriers such as subsidised fuel prices, limited ability to serve the market and a low level of awareness among power utilities, must be overcome. EPIA expects solar PV prices to digress 41-53% by 2020, and 56-66% by 2030 compared to 2010 for systems in the 1 MW class. Compared to peak power generation from diesel generators, solar PV is already competitive if the diesel is not subsidised. Emerging markets for solar VP systems and services. The accelerated scenario here suggests an installed solar PV base of 7 GW by 2020, reaching 27 GW by 2030. A paradigm shift would see potentially 13 GW by 2020 and 54 GW by 2030. Here the accelerated scenario predicts an installed solar PV base of 10 GW by 2020 and 46 GW by 2030. Under a paradigm shift scenario, 20 GW could be installed by 2020 and 92 GW by 2030. The accelerated scenario assumes a muted development of solar PV in China with ‘only’ 160 GW installed capacity by 2030 (its target is 20 GW by 2020). India could contribute 68 GW by 2030. Jointly the two countries could account for 228 GW or 56% of overall Sunbelt solar PV potential under the accelerated scenario. Under a paradigm shift scenario, China would have 640 GW of installed solar PV generating a 12% share in power generation by 2030. India would reach 130 GW installed solar PV. Jointly, the countries would account for 69% of Sunbelt solar PV potential. 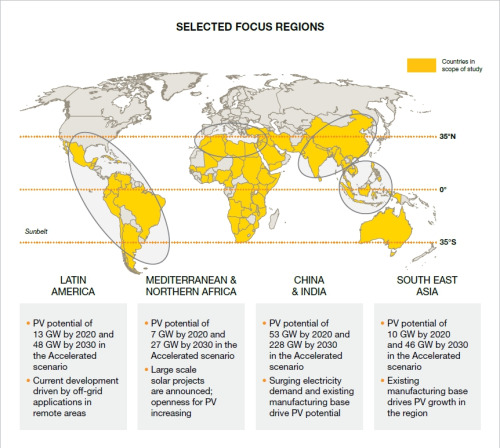 In Latin America, EPIA’s accelerated scenario suggests an installed solar PV base of 13 GW by 2020, reaching 48 GW by 2030. A paradigm shift scenario would see a potential 25 GW of solar PV installed in 2020 and 96 GW in 2030.